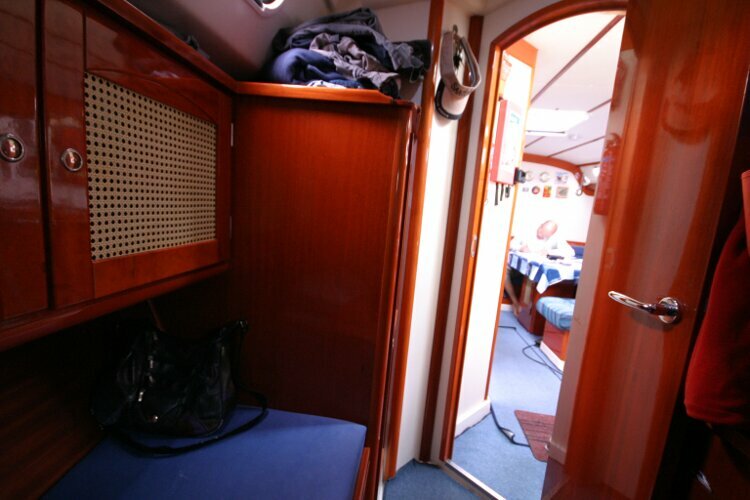 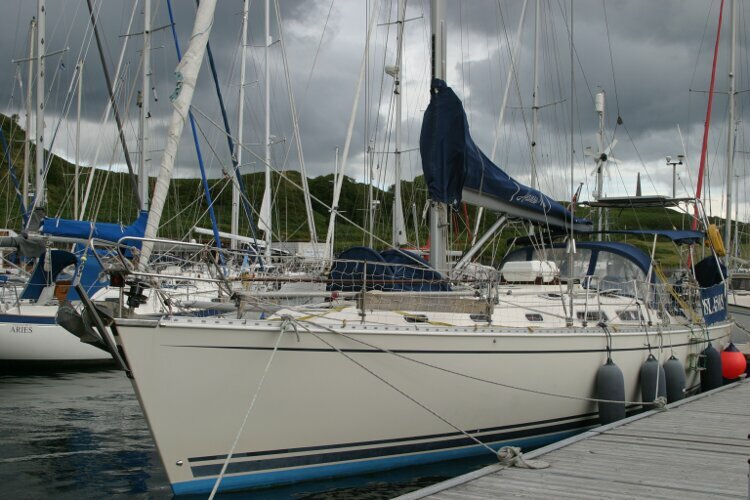 An ideal blue water cruising yacht, sails well in all conditions. 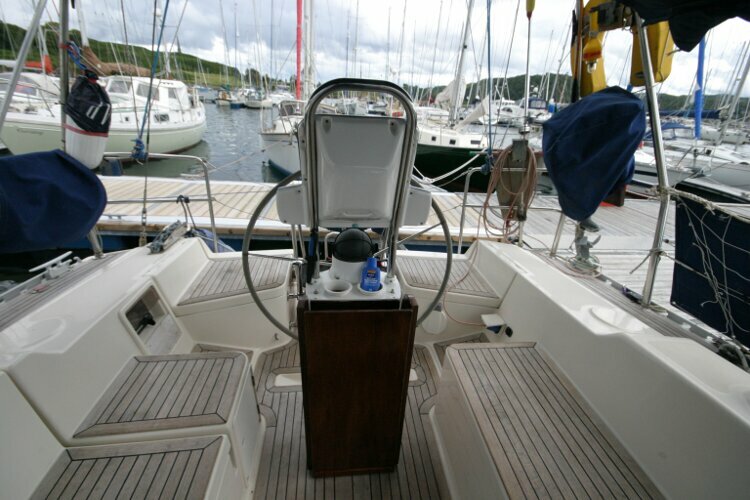 Equipped to be self sufficient on long passages, in ready to go anywhere condition. 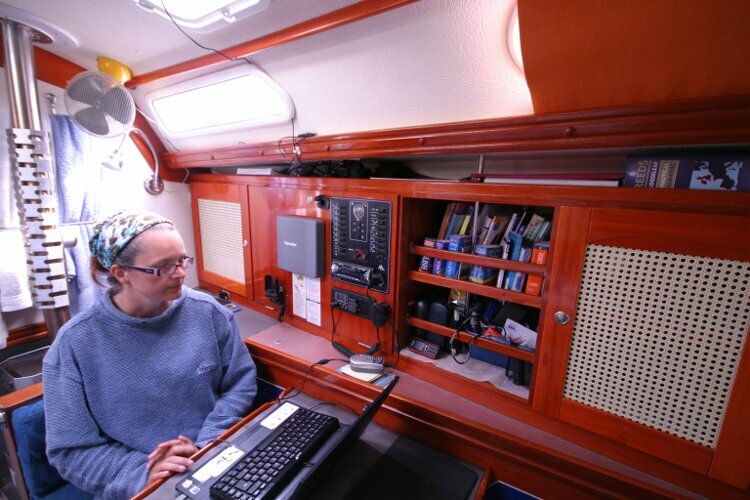 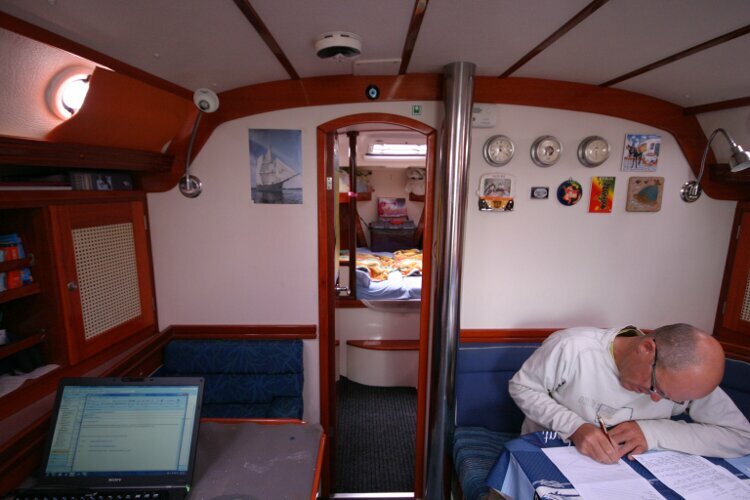 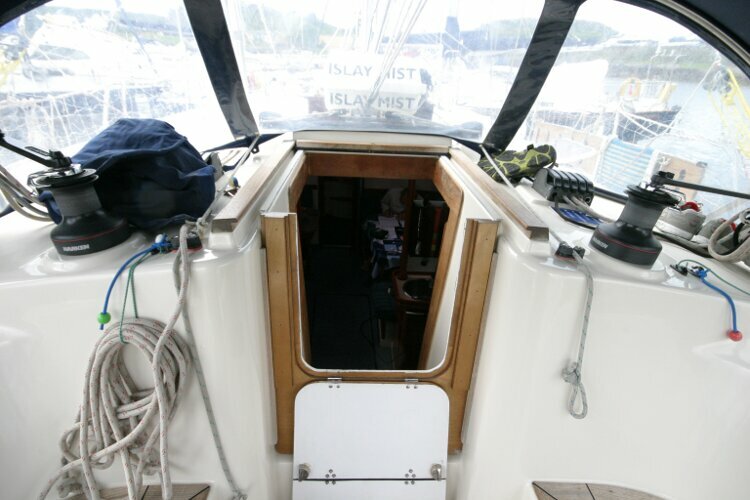 Batteries, anchor windlass, 75 metres of chain, mainsail, gennaker, liferaft, hydrovane and watermaker were all new in 2011 for a planned Atlantic Crossing and USA East Coast cruise. 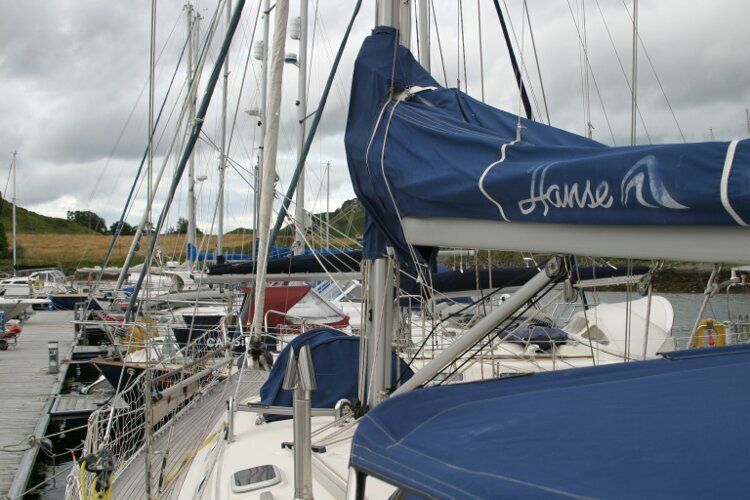 The owners have practically brought up their two children (now 7 and 8 years) on board from just 6 weeks old. 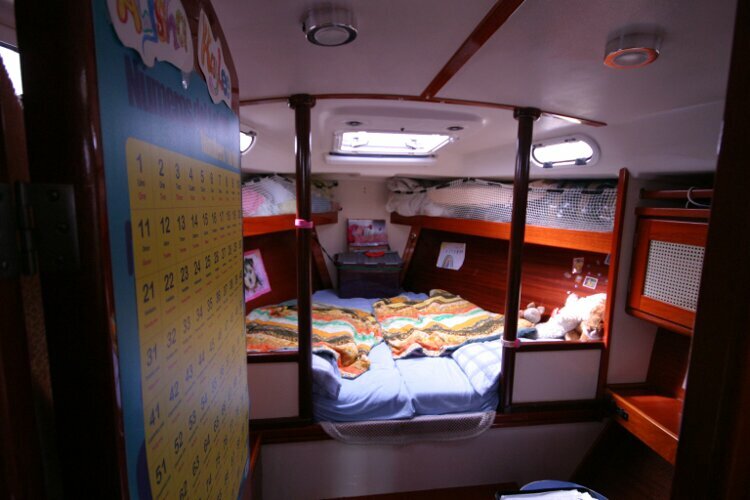 The growing children now need a short school attending break, followed by setting sail in, hopefully, a bigger boat. 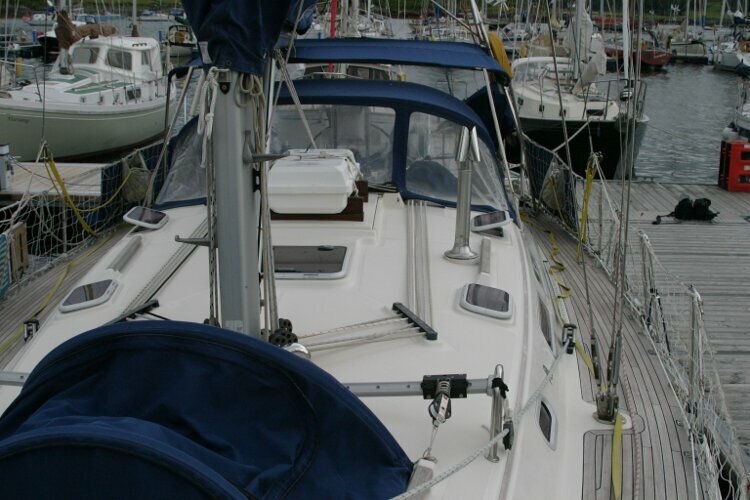 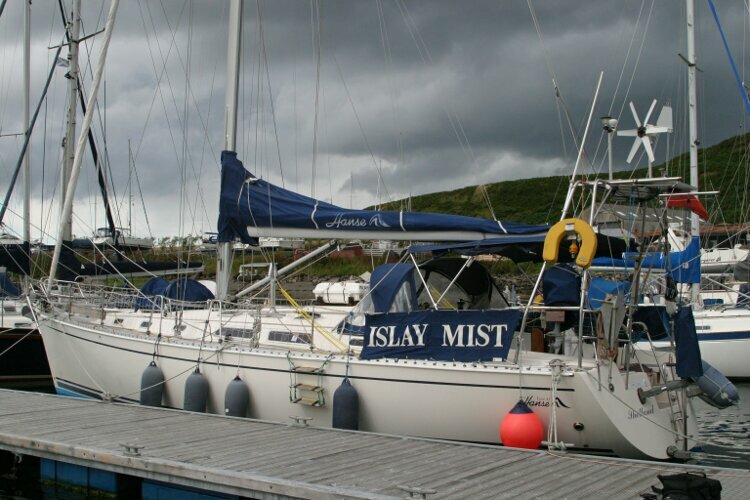 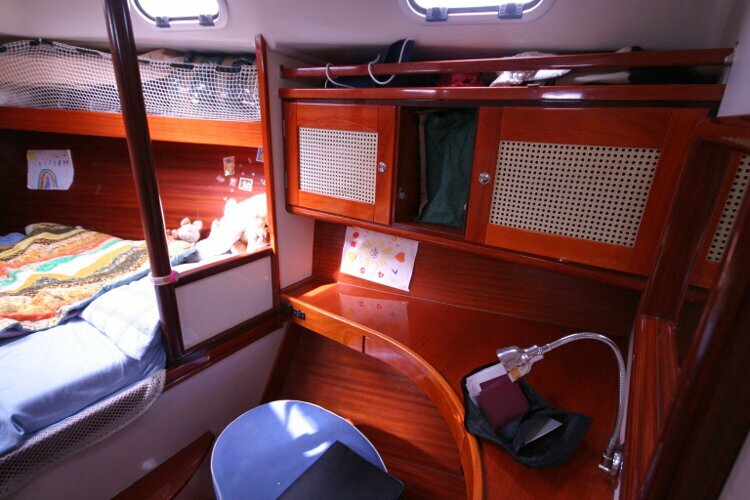 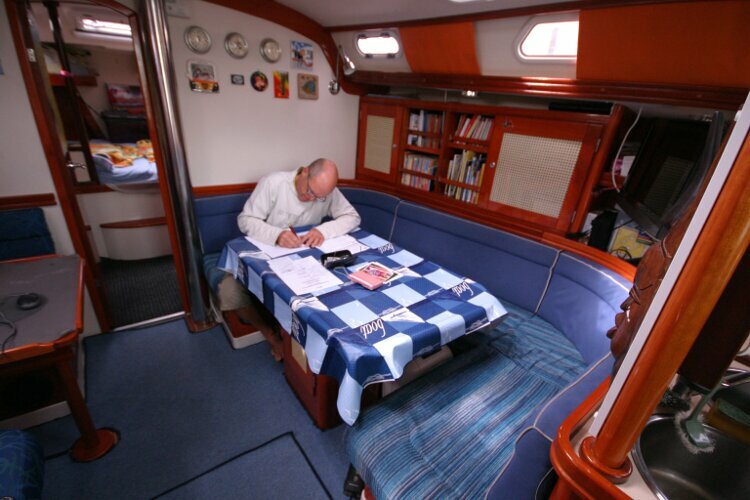 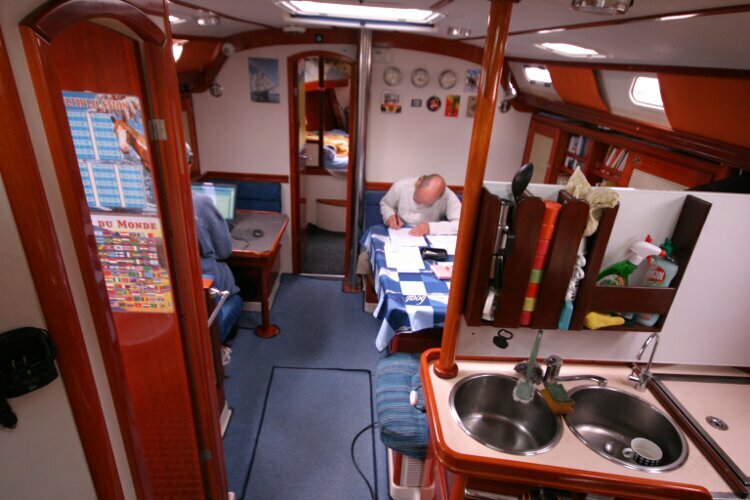 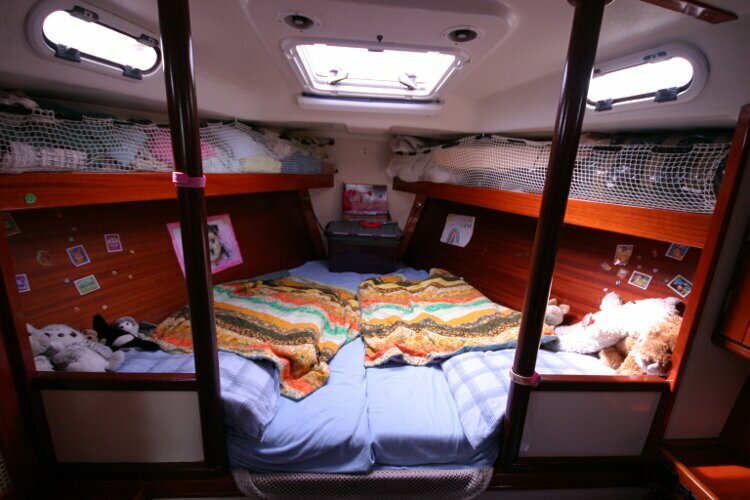 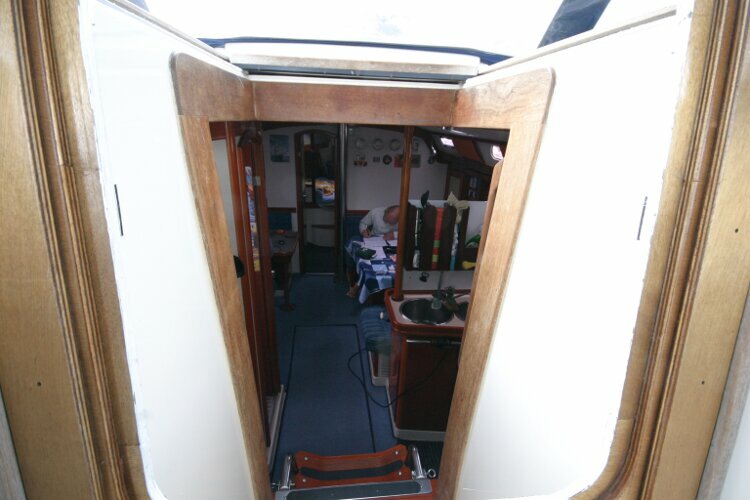 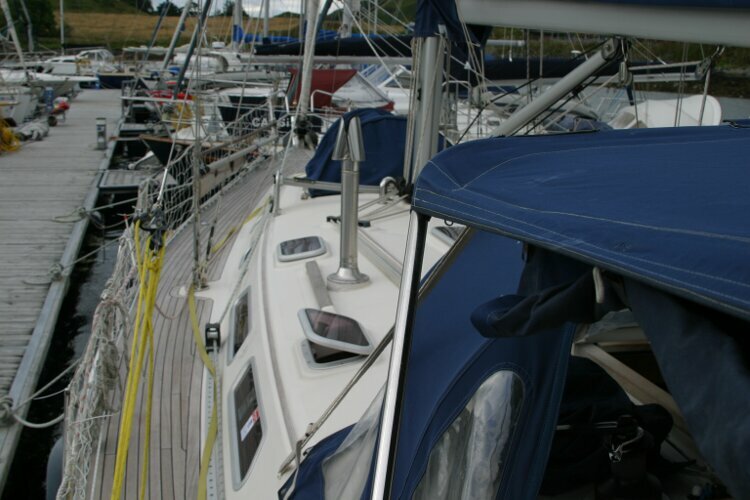 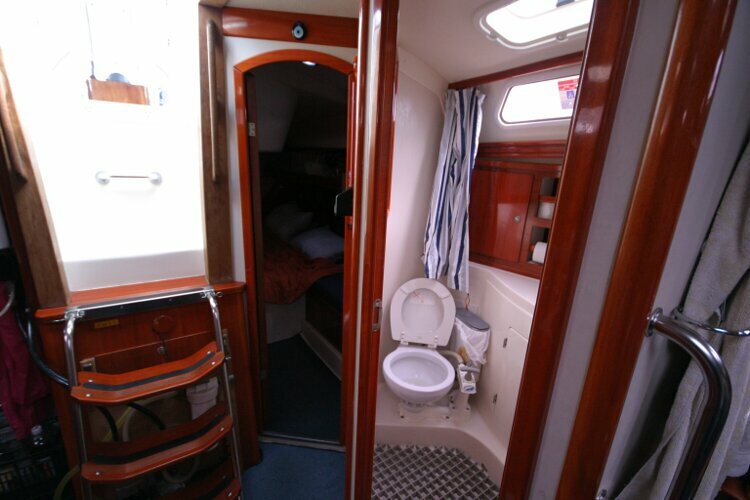 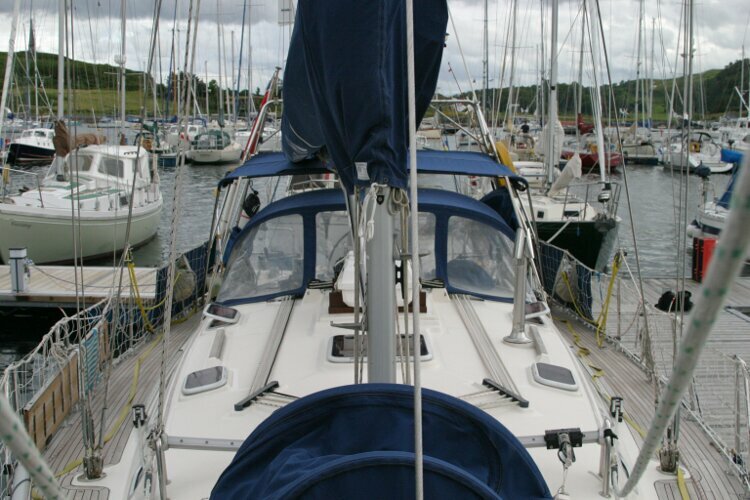 Purchased new in 2004 by the current owners, she sailed with two adults and two infant children around the UK, Ireland, Norway, Northern Isles, France, Spain, Portugal, round the Mediterranean - a three year trip. 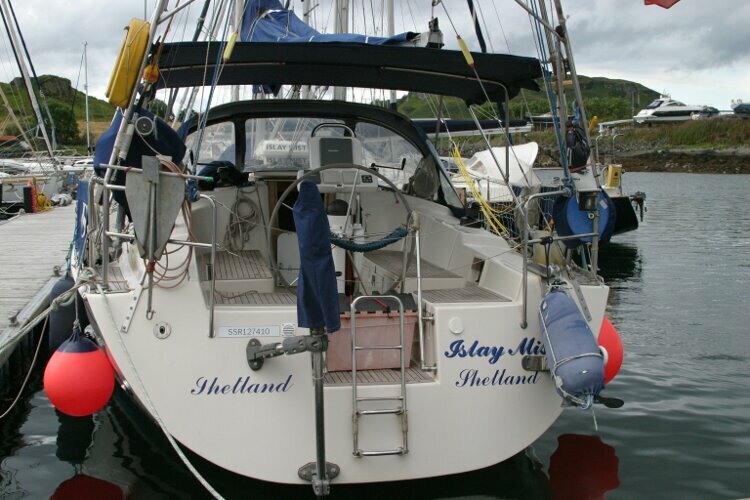 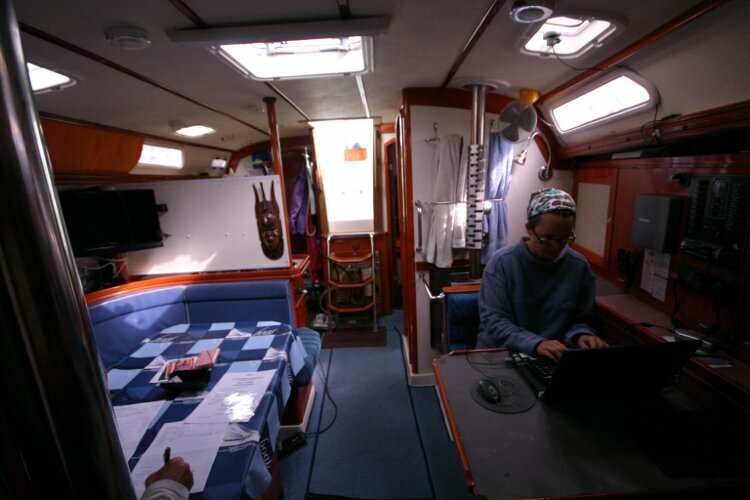 With a maximum speed of 8 knots, she is a fast passage maker with a very good average speed capability, achieving an average of 6.5 knots on a 600 nautical mile passage from Spain to Ireland, good for a family home! 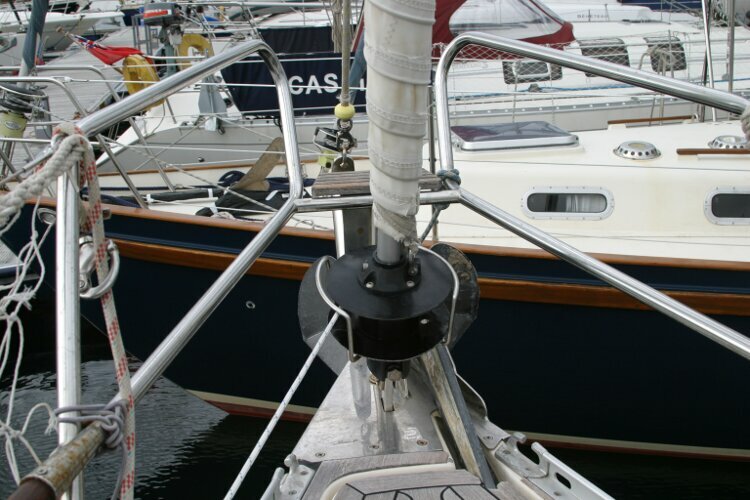 She can be easily sailed by a couple or single handed. 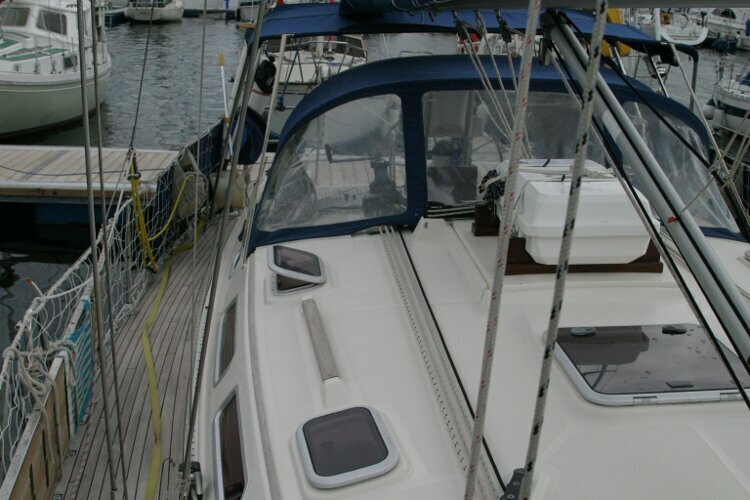 All systems are upgraded to suit long term cruising and she is exceptionally well maintained and ready for ocean cruising. 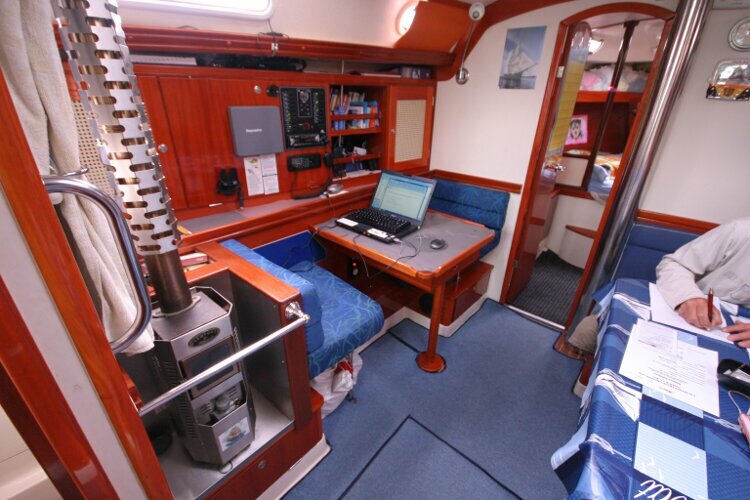 She is fully equipped for hot climates - bimini, water maker, extra fans on the fridge cooler, cabin fans, as well as for cold climates with insulated hull and deck, two heating systems and a hot water system. 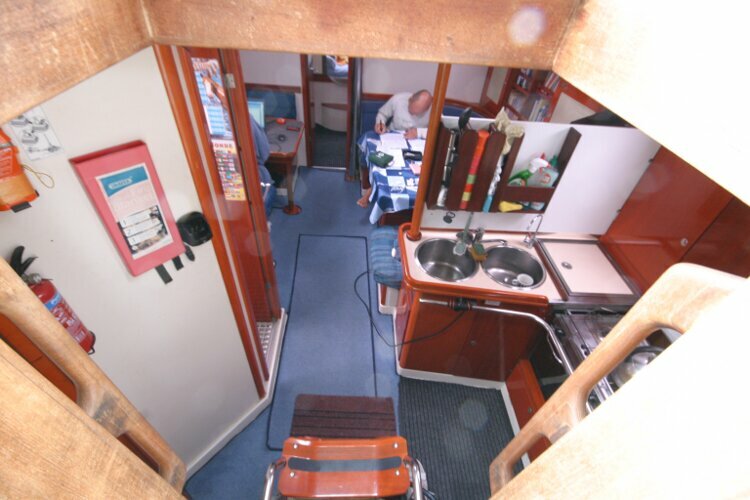 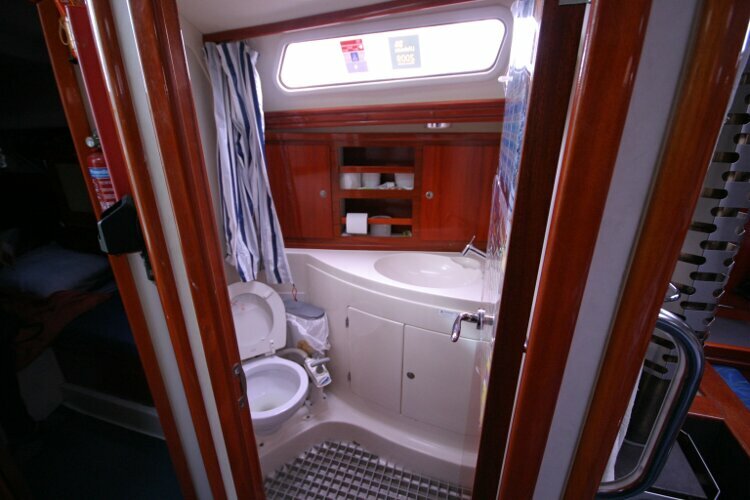 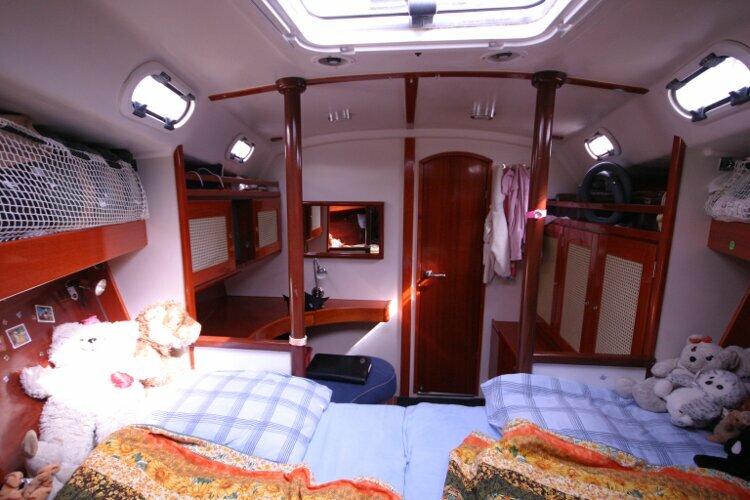 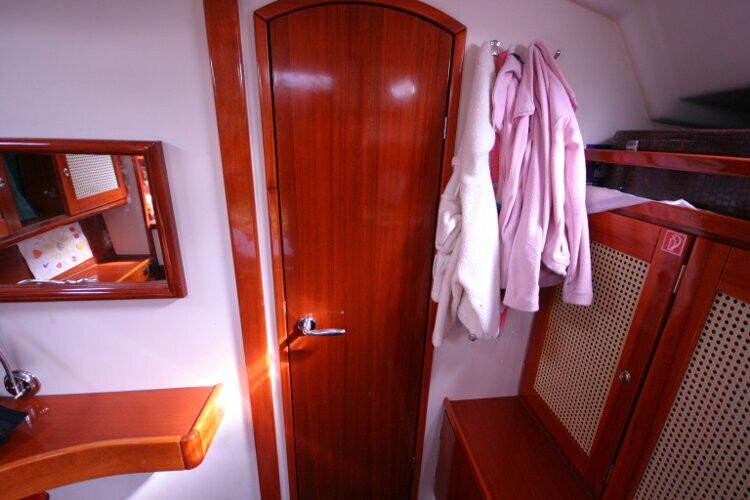 Aft double cabin, single saloon berth, forward double V berth. 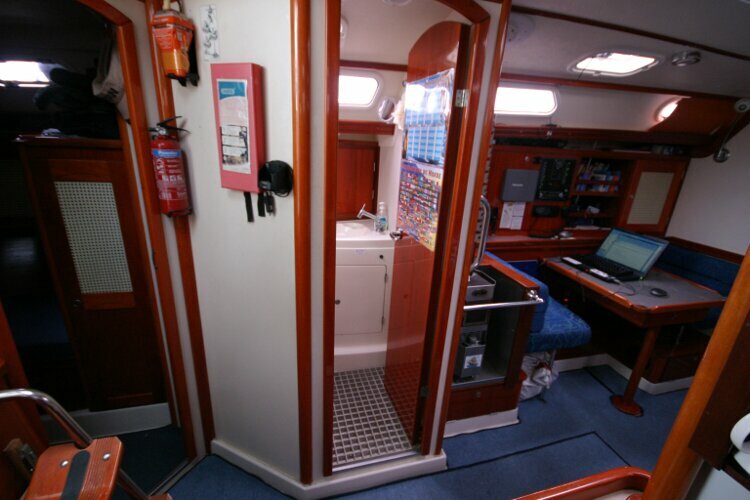 Heads compartment with shower. 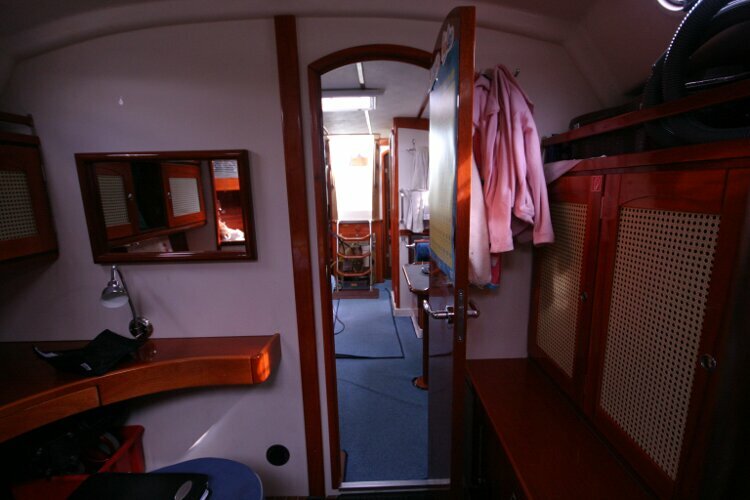 Large workshop/storage area that can be used as a third double aft cabin. 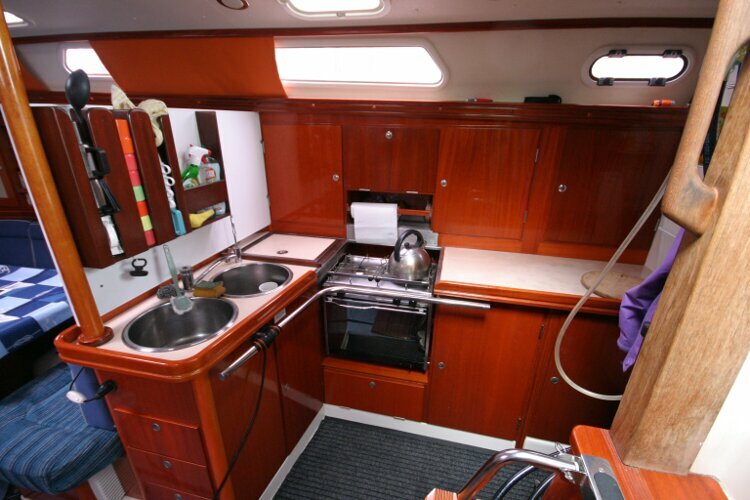 Gas cooker with two burners and oven. 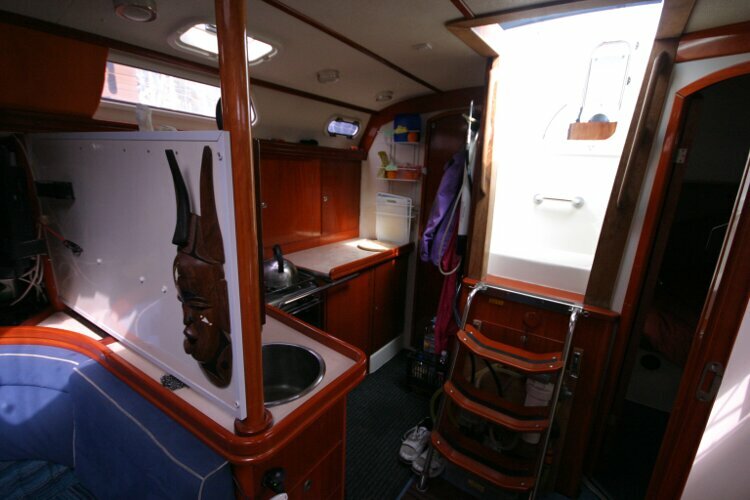 Double sink. 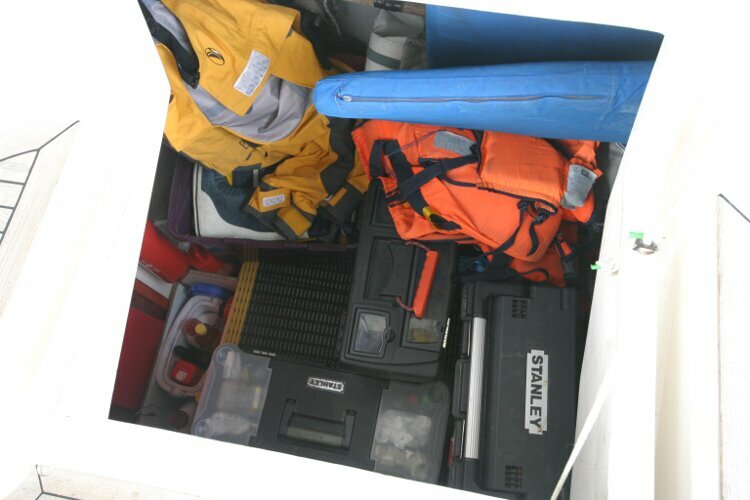 Cool box. 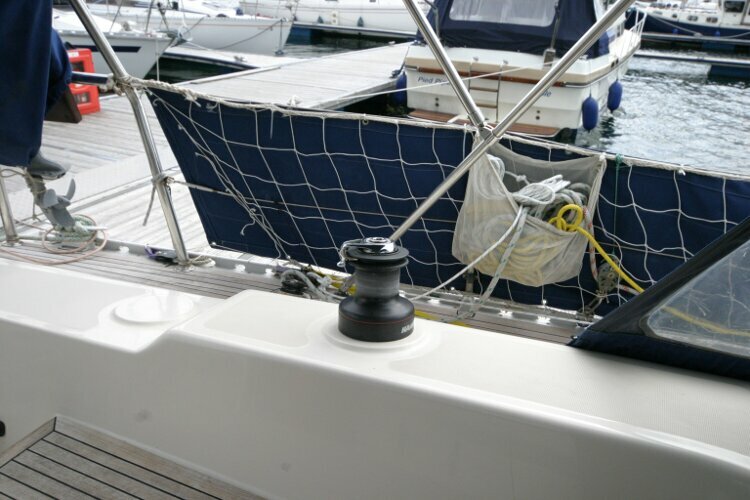 Fresh water filter tap. 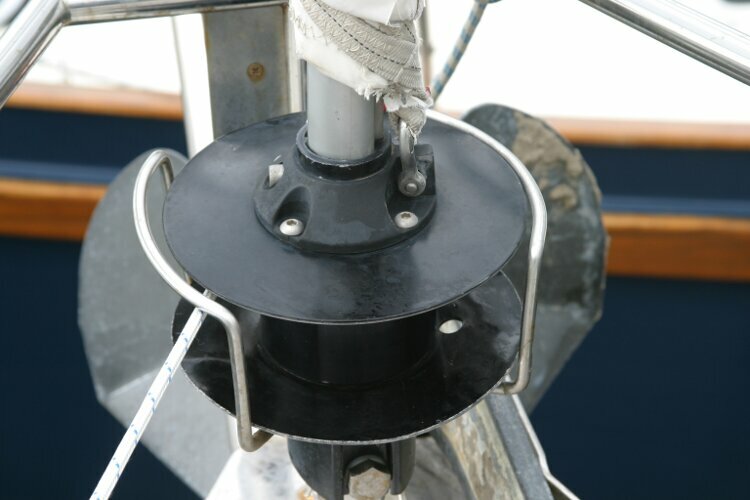 Power Survivor 80-11 Water Maker. 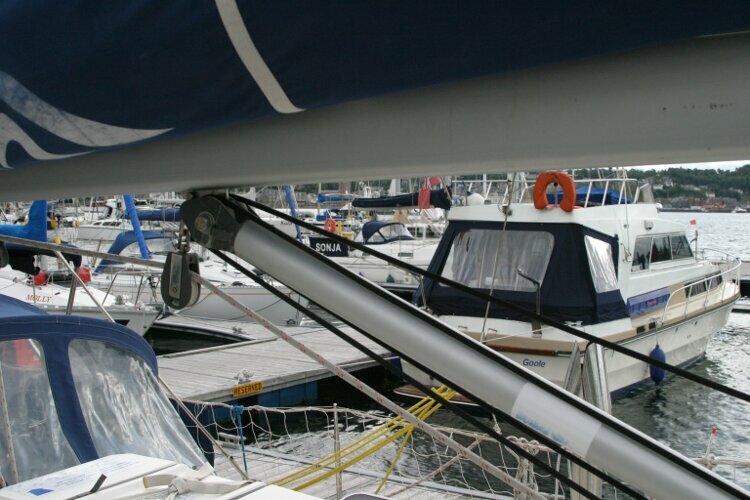 Hot and cold pressurised water is available at all points. 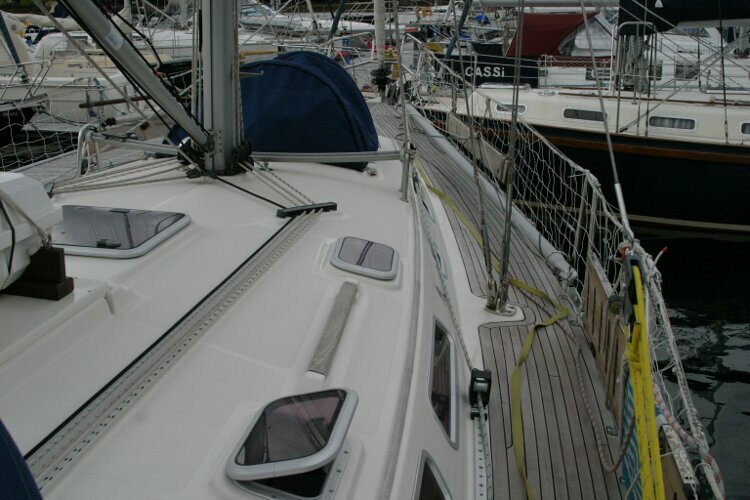 She is VAT paid and RCD(CE) compliant. 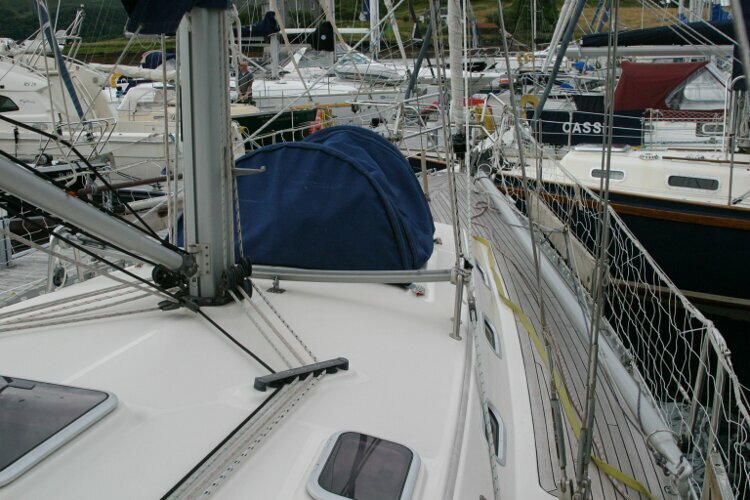 2 mainsails, by Elvstrom and North Sails, Self tacking Jib and Genoa bt North Sails. 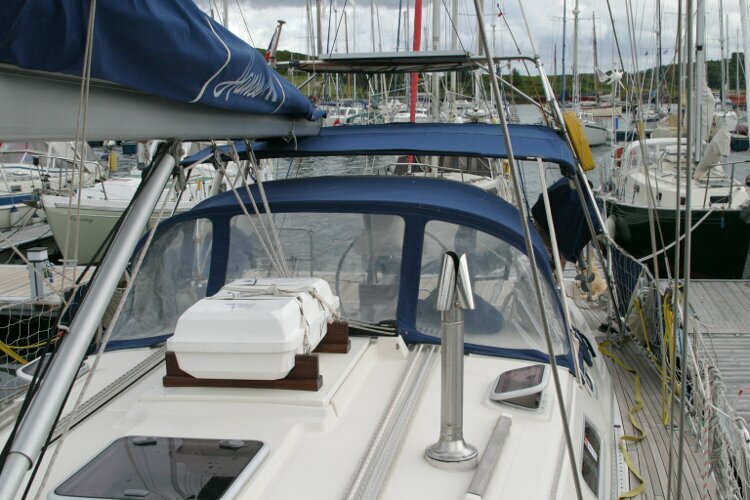 Raymarine Radar and Plotter - RL70C + RC530 depth, log, wind. 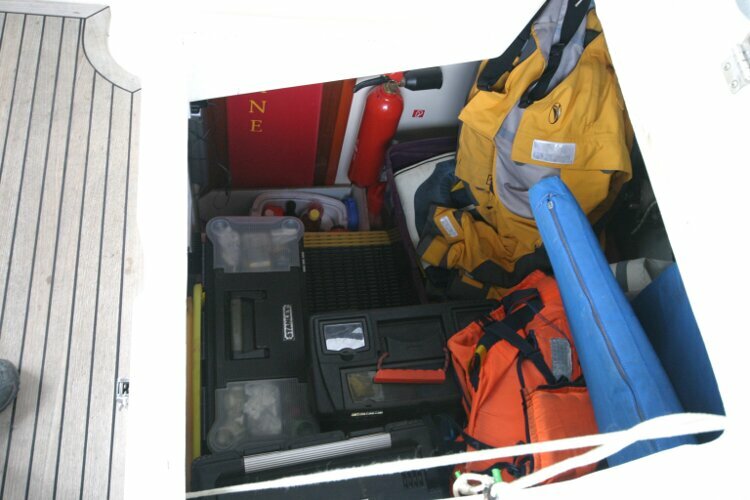 VHF, radio, CD, tape, TV. 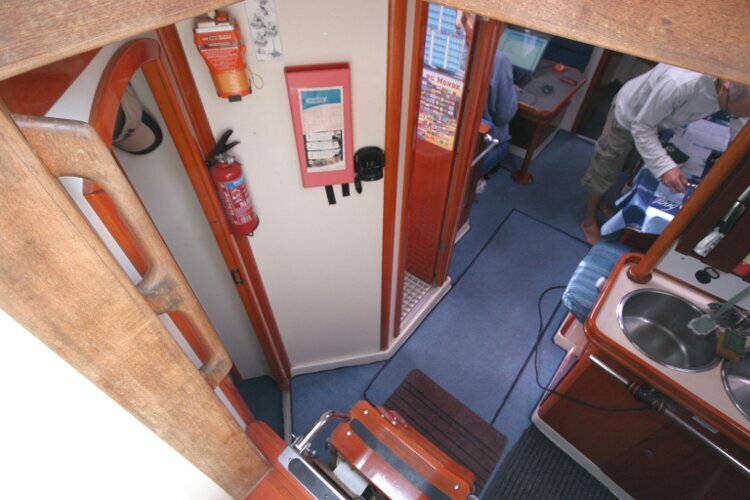 Bilge, smoke and gas alarm. 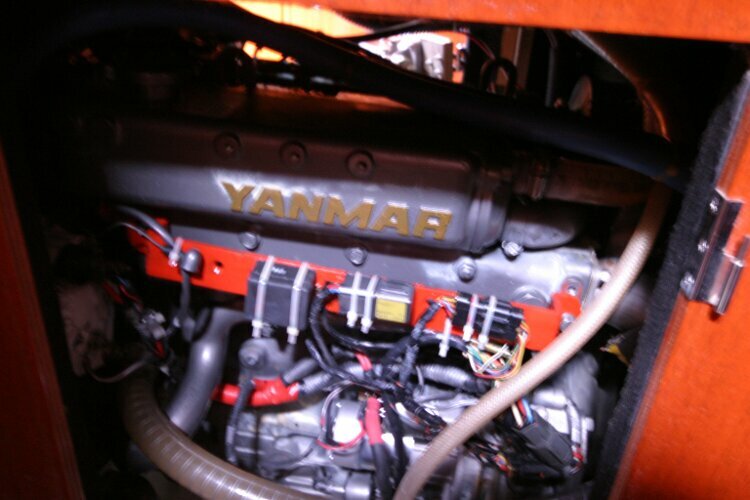 12 volt system. 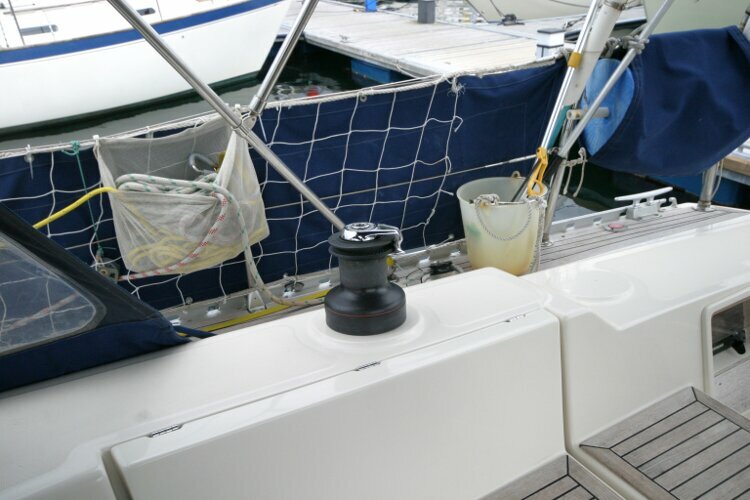 Full shore power system. 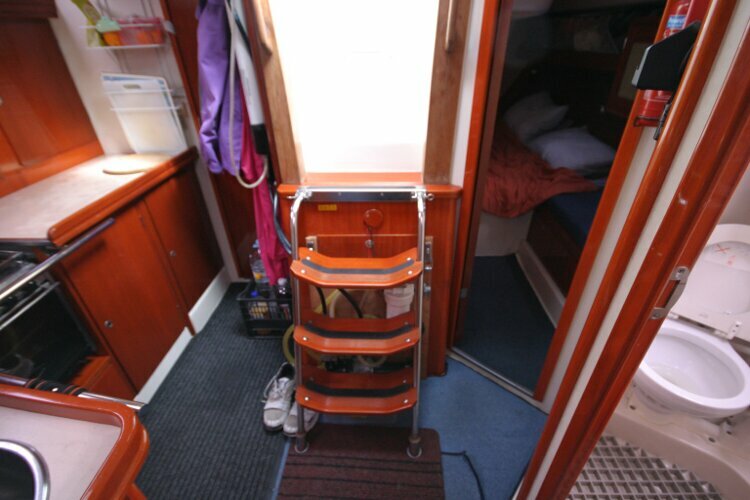 Battery charger/12volt supply. 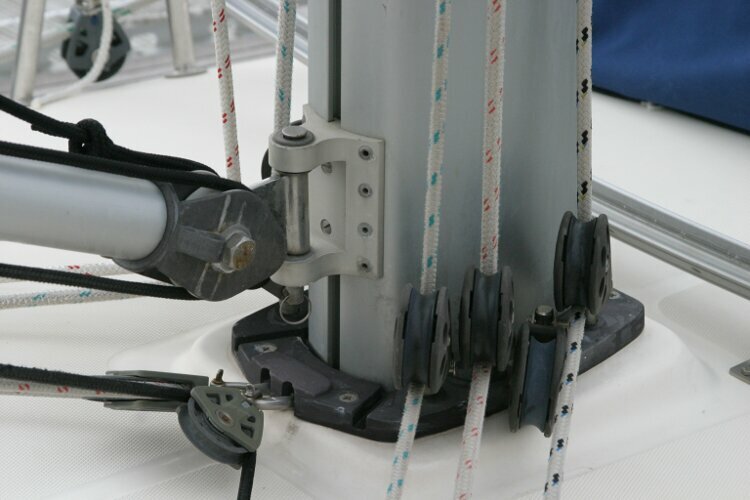 12 volt outlets. 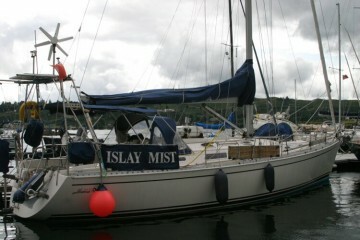 Inverter. 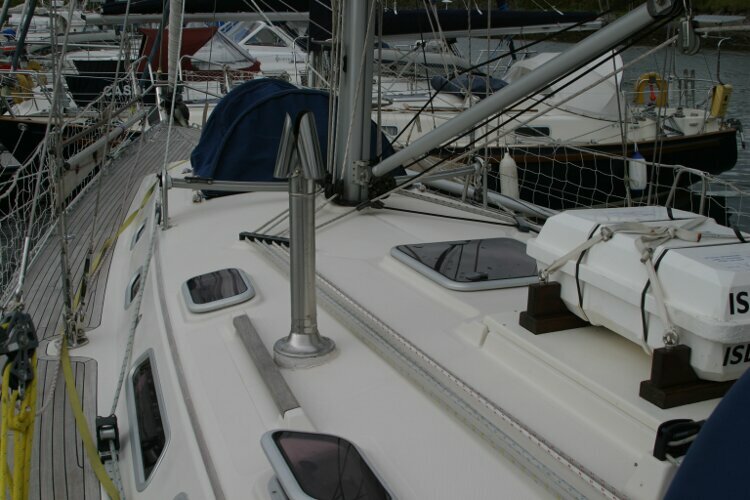 2x80 watt solar panels. 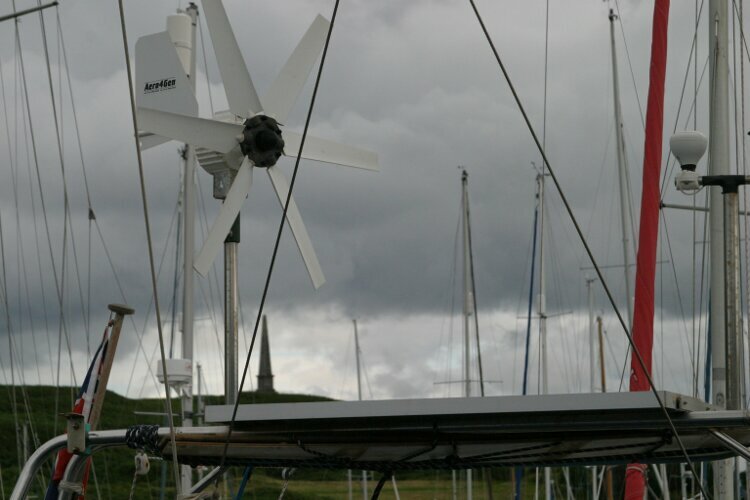 Aero 4 Gen wind generator. 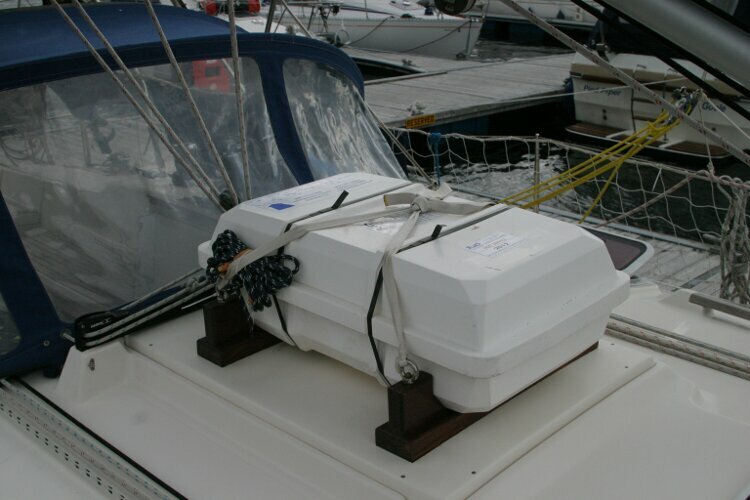 500 Ah domestic battery bank and separate banks for starting and the bow thruster. 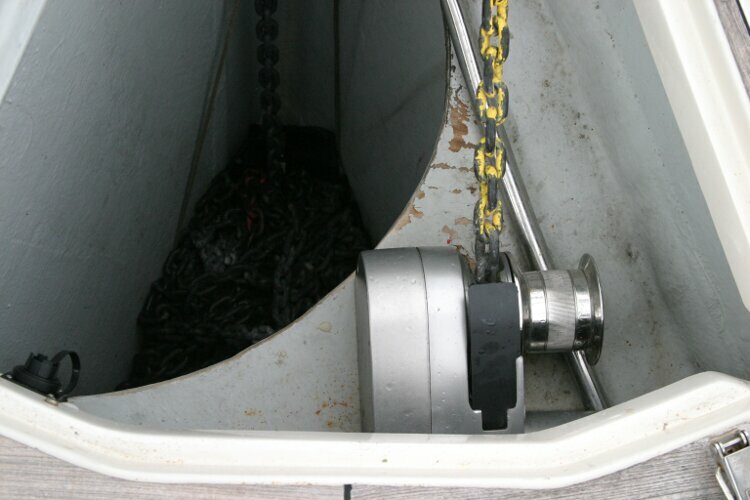 Ground tackle consists of 3 anchors plus 75 metres and 40 metres of chain, 60 metres of trawl rope and a new anchor windlass. 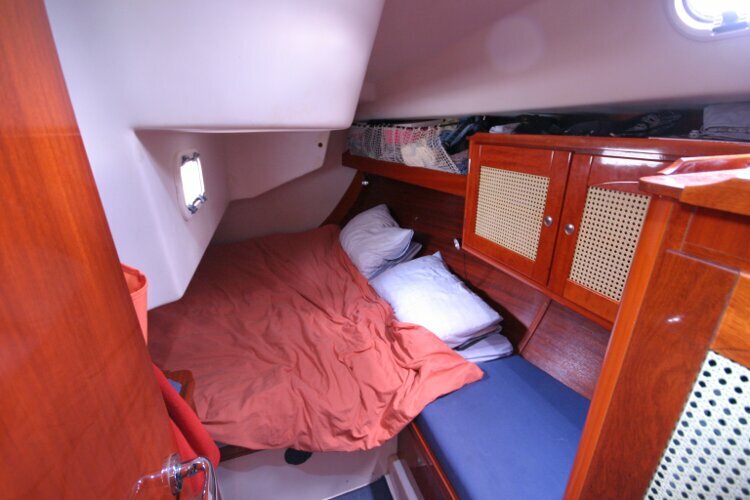 6 person life raft. 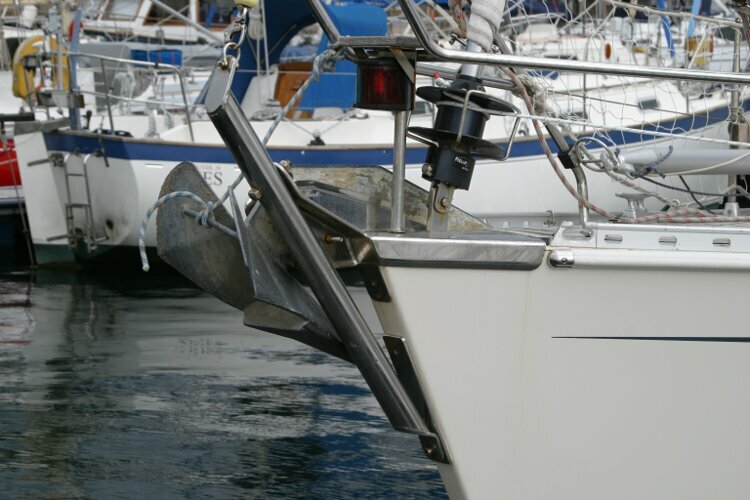 Avon tender on davits. 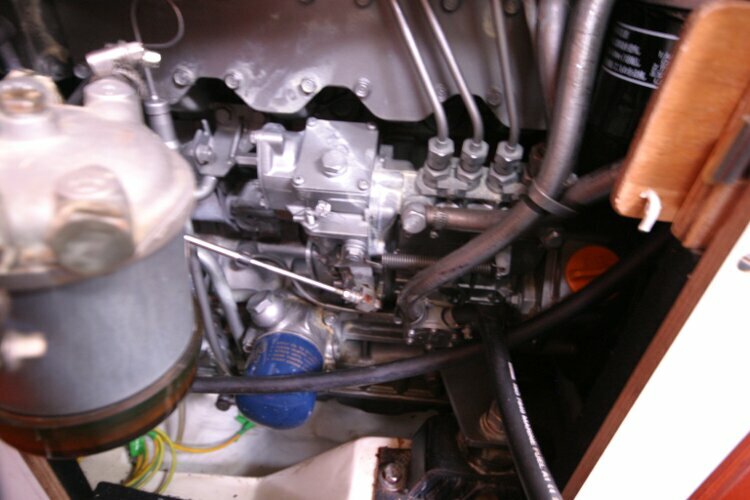 Hydrovane self steering. 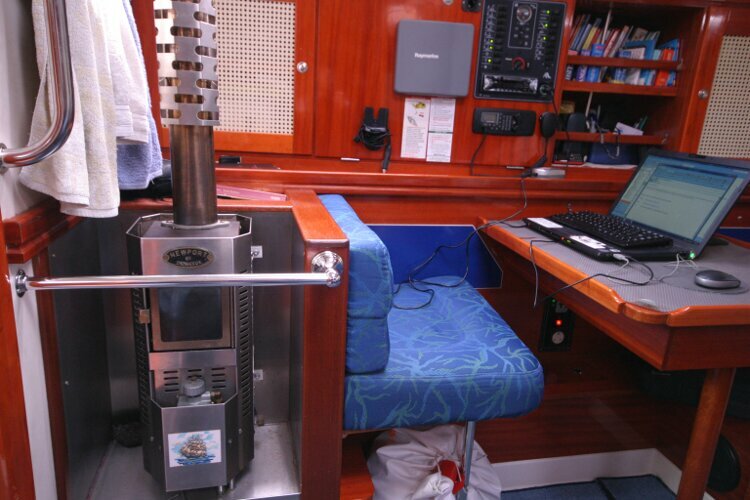 Webasto 3.5 KW warm air heater and Dickinson Cabin heater, both running on diesel. 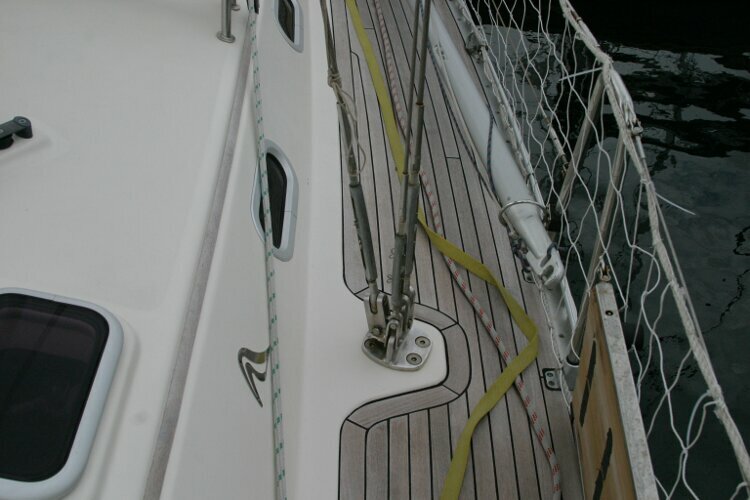 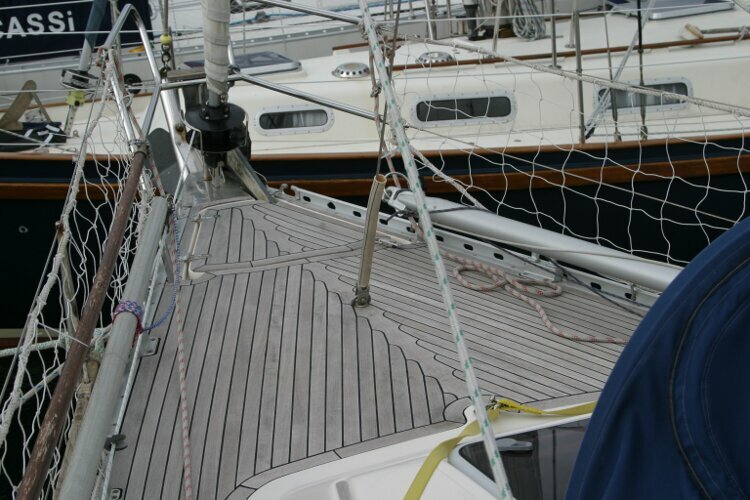 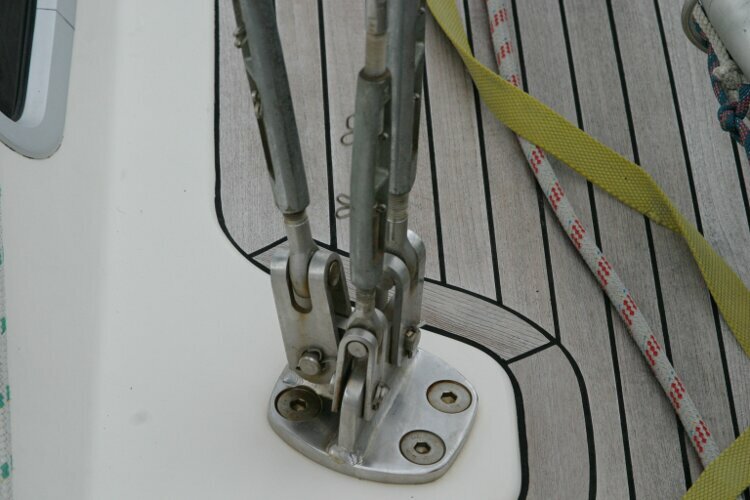 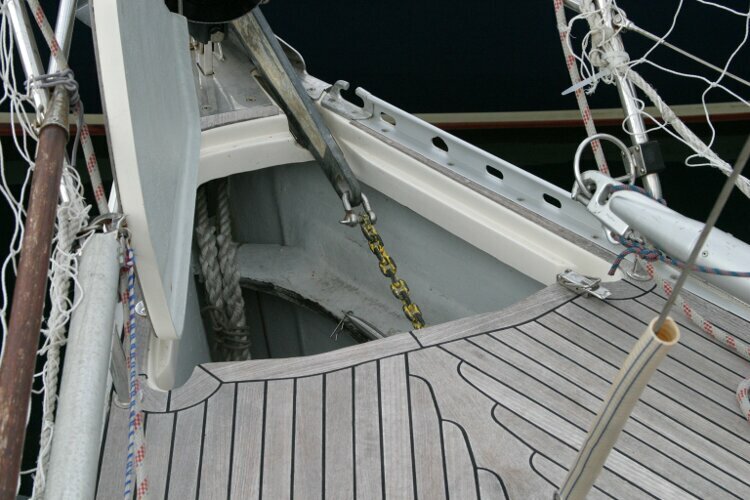 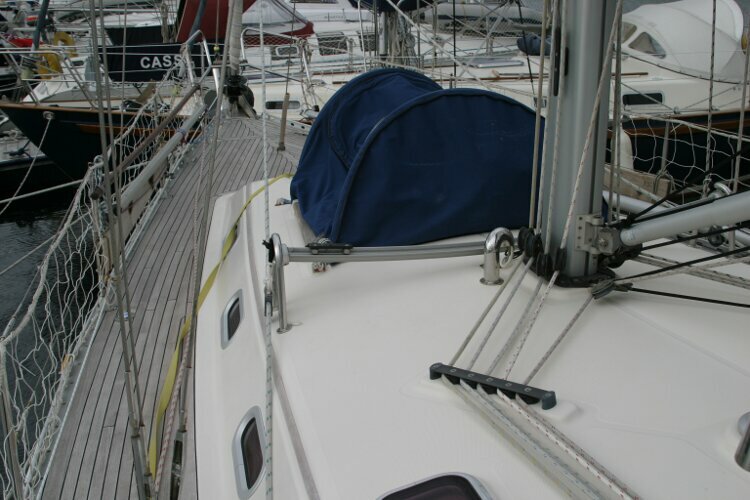 Recently fitted batteries, anchor windlass, 75 metres of chain,mainsail, gennaker, liferaft, hydrovane and watermaker. 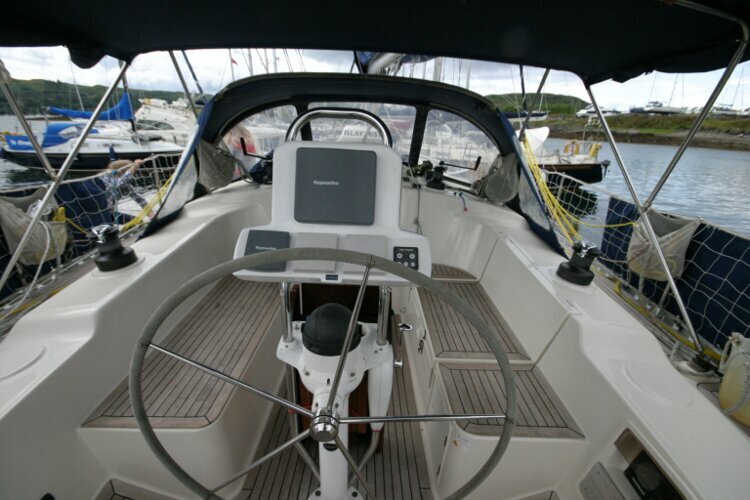 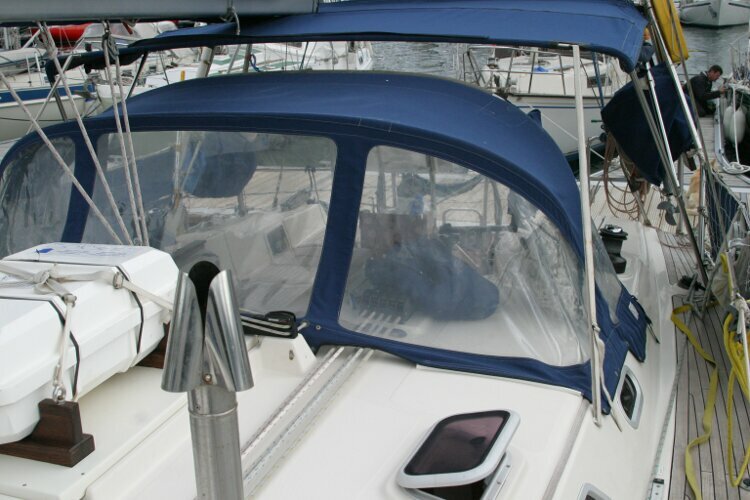 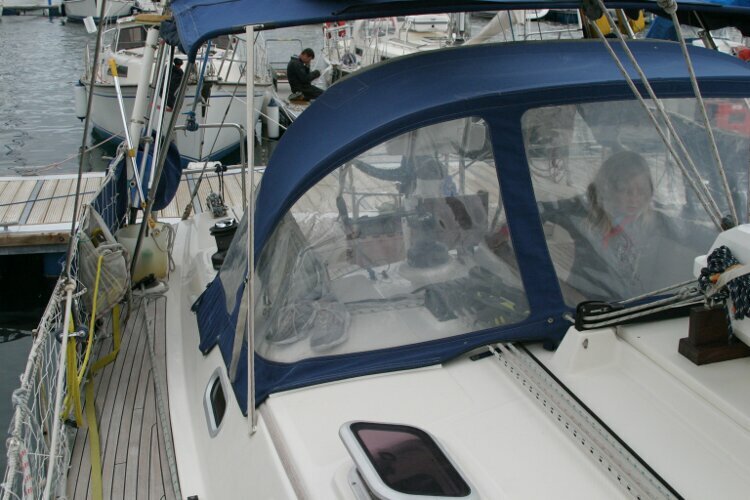 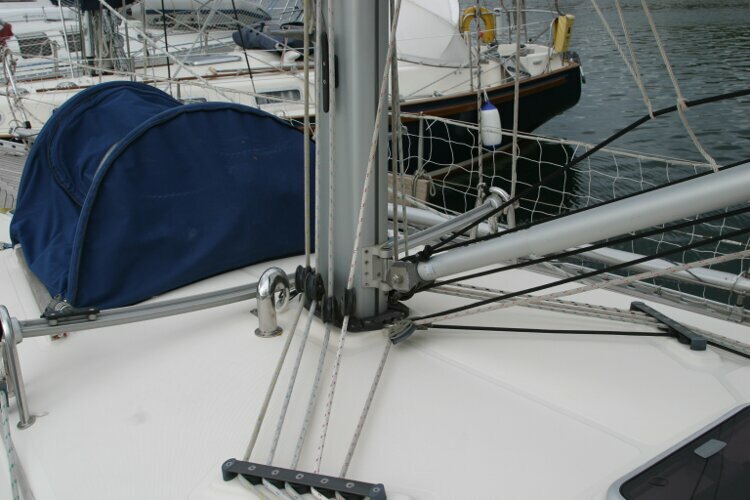 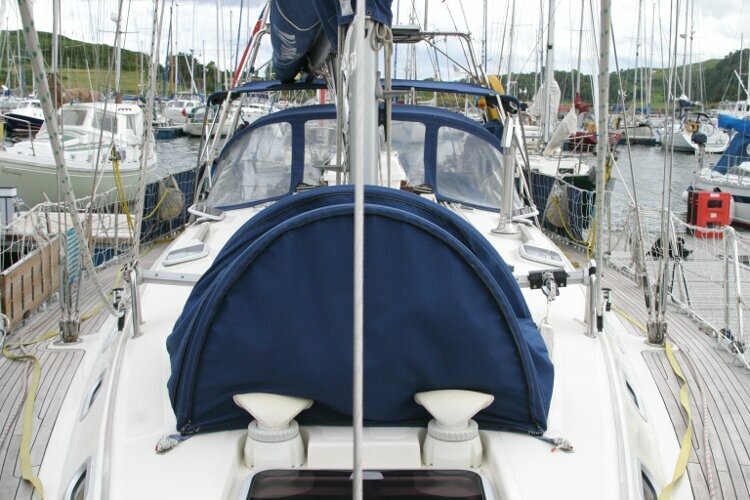 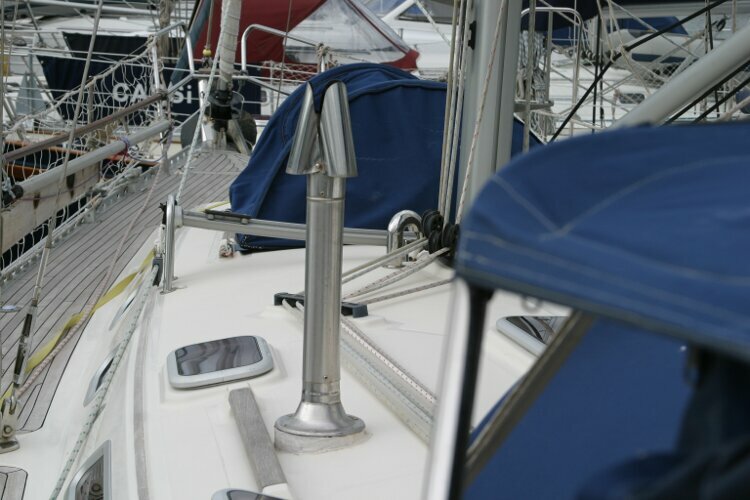 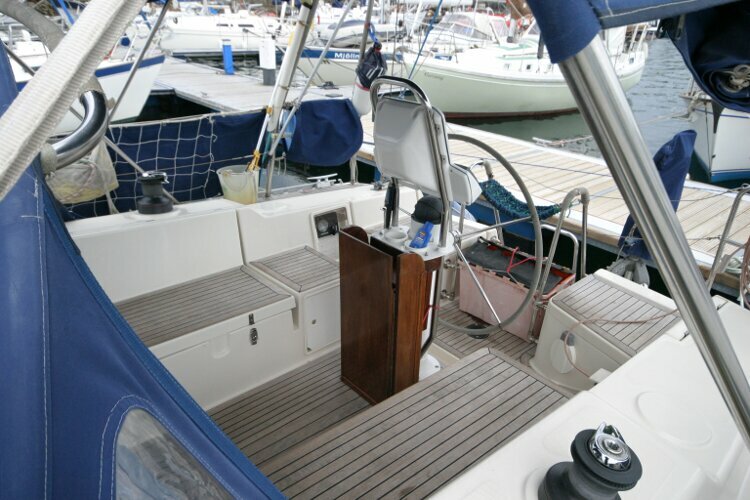 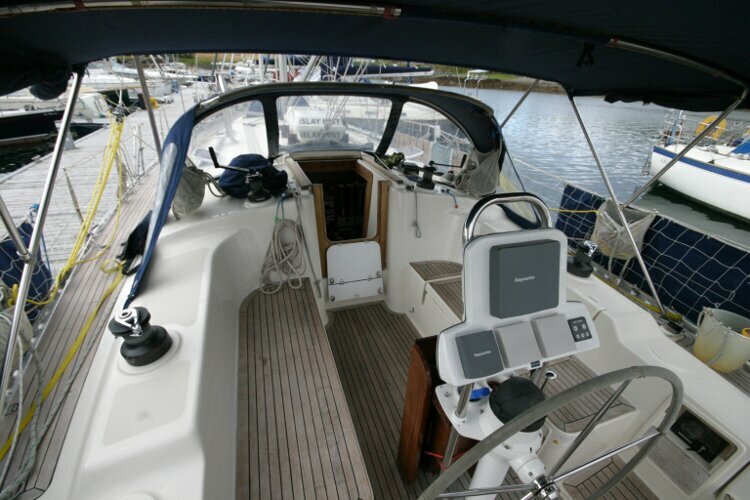 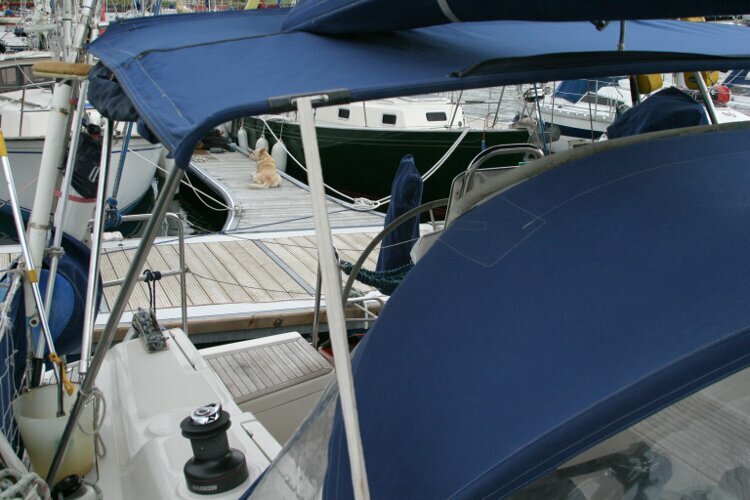 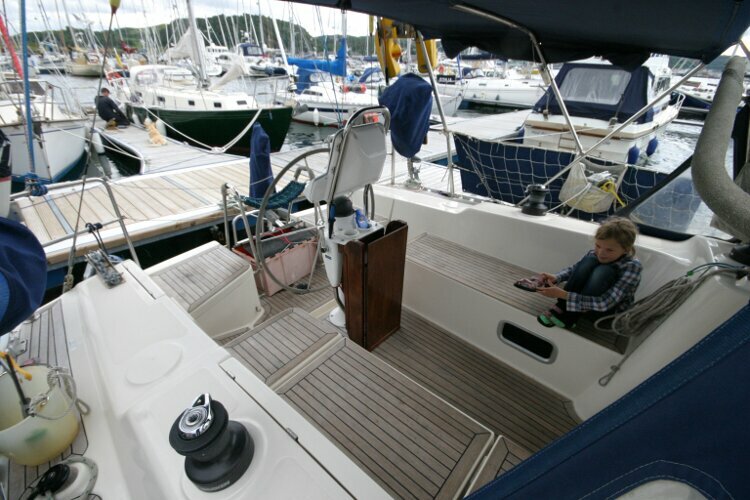 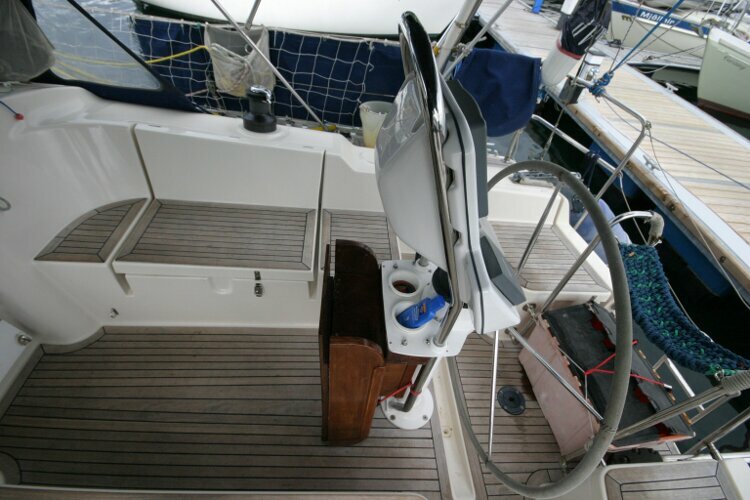 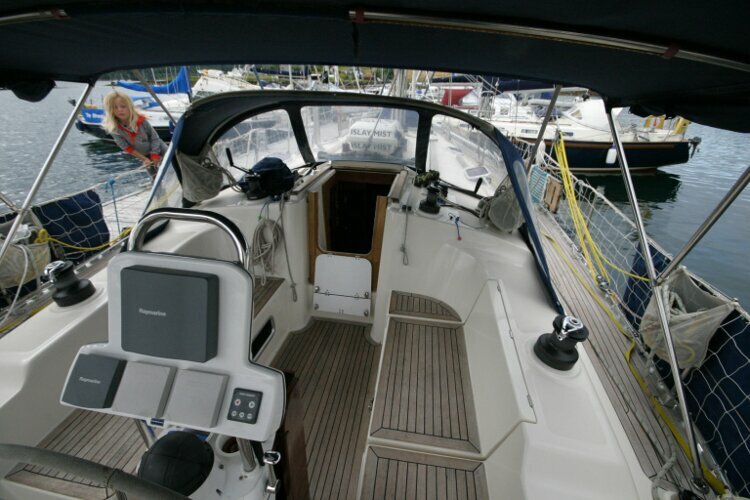 The sail drive is fitted with a Brunton auto prop. 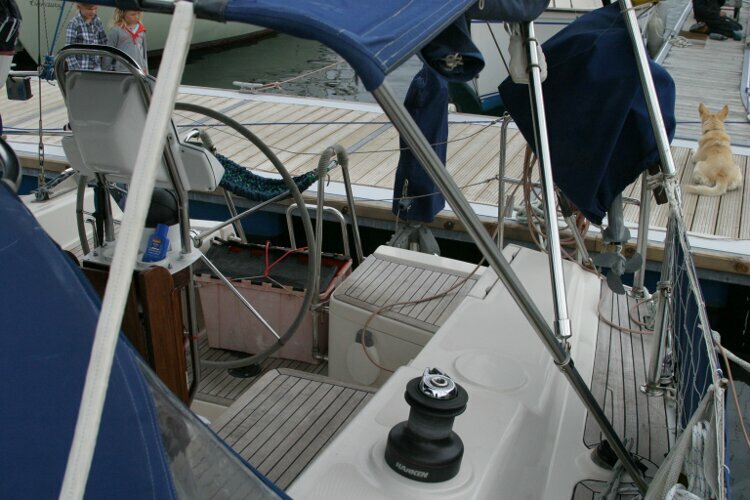 A spare 3 bladed propeller is also carried. 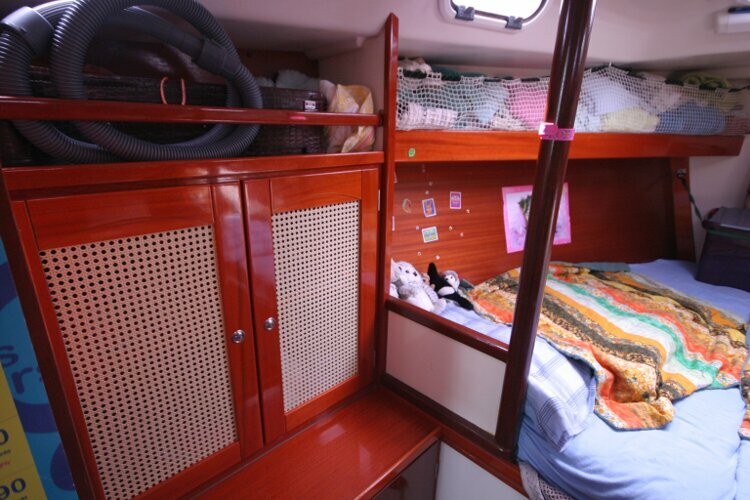 A very useful deck tent for storage is mounted on the coach roof.